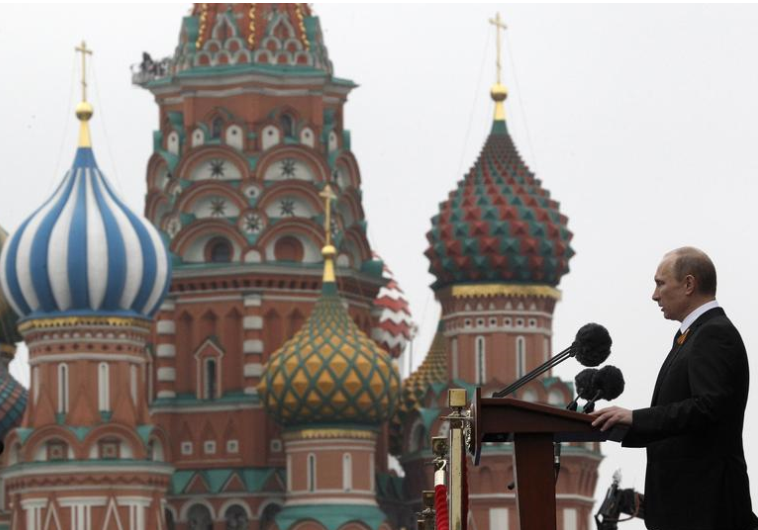 JERUSALEM, Israel -- Russian President Vladimir Putin warned Israel against supplying weapons to the Ukrainian government, which is battling a Russian-backed insurgency in its eastern province. Russian President Vladimir Putin makes a speech during the Victory Parade on Moscow's Red Square. “This is a choice, a choice of the Israeli leadership; they have the right to do what they consider appropriate. I think it is counterproductive, if it concerns lethal weapons, because it will only lead to yet another swirl of confrontation, to more human casualties, but the result will be the same,” Putin said in an interview on Rossiya 1 TV on Saturday. His words were reported as well on the English-language news website for Sputnik International. In Israel, the Prime Minister’s Office and the Defense Ministry had no response to the report. Israel has been upset by Russia’s decision last week to lift its five-year ban on the sale of the S-300 anti-missile system to Iran and to deliver those weapons by the end of 2015. It had voluntarily halted the sale of the weapons to Iran in 2010 under pressure from the West and because it was believed that such a ban would help sway Iran to enter negotiations over its nuclear program. Earlier this month, six world powers – Russia, the US, China, France, the UK and Germany – reached a framework agreement to curb Iran’s nuclear program. Israel has argued that the deal, which has yet to be finalized, would not prevent Iran from producing nuclear weapons. Russia’s actions, it has said, is proof of the deal’s danger. On Thursday, Putin explained the deal in a special call-in broadcast on Rossiya 1 TV, in which he answered questions from the public. “Now that there is obvious progress on the Iranian track, we do not see why we should continue imposing this ban unilaterally,” he said. The Iranian Army held its annual parade in Tehran on Saturday to mark Army Day. Many new domestic weapons were unveiled during the event, including the Bavar-373 air-defense missile system. The system received much attention, as it was said by the Iranian media as being equivalent to Russia’s S-300 missile system. Meanwhile, the US military option to prevent Iran from obtaining a nuclear weapon, and to encourage a diplomatic solution, remains intact despite Russia’s decision to deliver the S-300 system to Tehran, Gen. Martin Dempsey, chairman of the US Joint Chiefs of Staff, told a news conference on Thursday. “We’ve known about the potential for that system to be sold to Iran for several years and have accounted for it in all of our planning,” Dempsey said.